Following its initial trend report earlier this year, Education New Zealand (ENZ) has released an updated International Education Snapshot with enrolment data for the first eight months of the year. International student enrolment declined 3% year-to-date (YTD). There were 84,150 international students enrolled in New Zealand as of 31 August 2013, reflecting a drop of roughly 2,400 students from the same period in 2012. Hidden within this overall drop is steady growth in post-secondary, where institutes of technology (ITP) and universities each grew by 4% YTD, and also in secondary enrolments, which grew by 2% YTD. However, those gains were offset by more severe drops in other sectors, notably in private training establishments (PTEs) and primary schools, which were down 14% and 9% respectively YTD. The bulk of the PTE decline has been accounted for by falling enrolments for English language providers. Those schools registered a 15% decline YTD for 2013 (equivalent to a drop of 2,020 students). 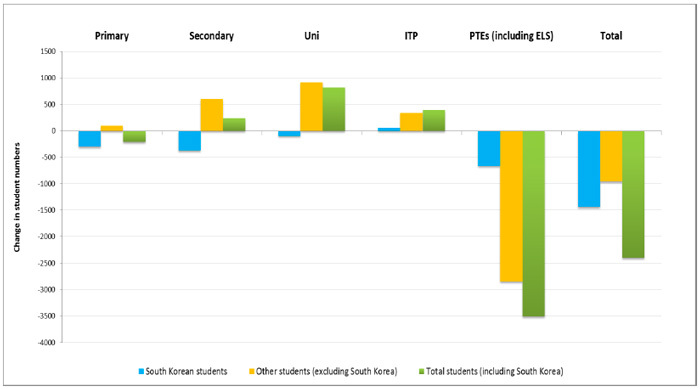 The falloff in primary enrolments was driven by a decline in South Korean students in New Zealand schools. Declining Korean enrolments accounted for 60% of the total YTD drop for New Zealand as a whole, and 145% of the total primary school decline in 2013 – once again overshadowing growth in primary school registrations from markets such as China and Thailand. All English language students who are studying at a University or a Category 1 provider, in a programme of study of at least 14 weeks, will be allowed to work part-time while studying. Aside from the issue of South Korean recognition of New Zealand credentials, ENZ notes that other macro trends are having a profound impact on student mobility in Korea. These include broad demographic trends that are reducing the pool of school-age students, increased efforts on the part of the Korean government to encourage Korean students to pursue more of their studies at home, and a relatively sluggish Korean economy that has registered only marginal growth since 2006. Even so, Education New Zealand notes that the overall commercial value of the sector remains steady, in relation to its 2012/13 valuation of NZ$2.6 billion and as a leading export sector for New Zealand. Further, the New Zealand government remains committed to its goal of doubling the sector’s value to NZ$5 billion by 2025. The New Zealand Education Story is based on a broader branding programme for New Zealand – the “New Zealand Story” – also launched this month. “The New Zealand Story profiles our innovation, our warmth and friendliness, and our place in the world with the ‘Open places, open hearts and open minds’ theme. The New Zealand Education story builds on these attributes with a specific focus on our growing international education sector,” said Minister Joyce. The “New Zealand Education Story” is reflected in a special launch video, and is supported by a marketing toolkit containing photographs, logos, branded templates and presentations for the use of New Zealand education providers and other stakeholders. The brand launch occurs against the backdrop of a broader government investment in building the sector. While the latest report from ENZ strikes a cautionary tone – “International education commentators are still forecasting an increase in demand for international education globally, however at lower levels than previously predicted” – the overall outlook remains optimistic. This entry was posted in Asia, Australia/Oceania, Higher Education, K-12, Language Learning, New Zealand, Regions, South Korea, Vocational, Work Abroad and tagged student recruitment, tertiary education overseas, secondary schools for international students, primary schools abroad, scholarships for foreign students.